No, it says “Early Access”. Did you try touching it and installing it? Yeah, I’ve tried. It says it’s full. 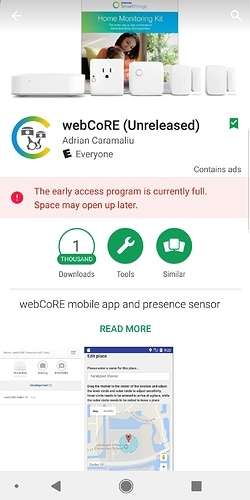 @ady624 @flyize Is WebCoRE presence sesnor/app working at all right now, or just concerns about battery? It used to work for me but stopped at some point past few months. I just went into the settings and the green plus sign was there so I added a new sensor for me, but it didn’t show in ST app or ST IDE device list, I tries clearing cache and killing both the ST and webcore apps. Still no new presence sensor, and the green plus is gone in webcore settings. It is not working for me on Oreo. And the battery usage was CRAZY. @flyize - The android app needs to be revised to address certain changes in Oreo, and unless and until that happens, it’s not worth the trouble. Disappointing, because it was working so well for me with minimum battery usage in Nougat. Same here with the oddity after Oreo. Thanks for reminding me to check resources. This doesnt seem to work anymore. No matter what I try, I cannot add a new device for as a presence sensor… Must be updates tot he S8. Oh well. Was nice while it worked. Is this thread is dead b/c everyone has the Android presence sensor working? or has it moved somewhere else…? I just don’t have it working but strangely enough I did get a update today at 8:09am. I’m with @infofiend, the update to Oreo effectively killed the app and there’s been no overt effort to make the changes necessary to get it working again. So for now I’ve had to uninstall it. It’s unfortunate (if perhaps somewhat understandable) that since ST kidnapped @ady624 that development on all things webCoRE have slowed dramatically and in some instances appears to have stopped altogether. I had actually hoped the opposite would be true because his work is amazing. Thankfully, we have many dedicated minions moving webCoRE forward wherever they can. Yeah, Tasker works about 98% of the time. I highly recommend it if you’re running Oreo or above.